Last Saturday, the Tewantin-Noosa Thunder First Grade Cricket Team defeated the Maroochydore Swans to book a place in the One-Day finals against Caboolture on February 10th. The TNT Fourth Grade team are also well placed to make their One-Day Finals. FIRSTS: For the first time in twenty years the RSL TNT First Grade Team will be playing in a final’s match – the One-Day final against the Caboolture Snakes. The team is also well placed to figure in the season’s premiership finals in March. This final’s berth has come about after a comprehensive win in their 50 Overs match against Maroochydore Swans last Saturday at Read Park. Batting first the home side struggled at times on a up and down pitch but were still able to register a score of 165, well below par for the season. Chris Wright started the innings well with an intelligent 38. Others to post scores were Adam Curry 23 and some late innings hitting by Troy Dennien 37 and Tom Freshwater 27. After lunch Scott Aufderheide and Tom Freshwater bowled with pace and swing and very few of the Swans batsmen were able to feel comfortable at the crease. The Swans were eventually all out for 107 with only one batsman standing up to score 41 no. Aufderheide returned to his early season form and took 5- 18 off his 9 overs. He was well supported by spinner Cody Rzeszkowlski who took 4 wickets (9 in the last two matches) and Freshwater picking up the other. Next weekend all teams return to the 2- Day format and the Firsts will travel to Beerwah to take on Glasshouse, in a match which is always very competitive. SECONDS: The team were confident of a win against Coolum at their ground. However, after losing the toss they were sent in to bat and in what is becoming an all too familiar scenario, the team were unable to handle the bowling and were dismissed for a disappointing of 112. 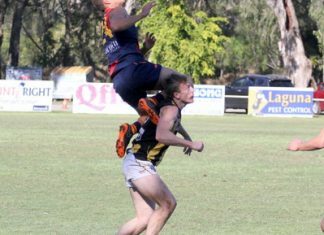 Those who contributed were Blake Steel 19, Robbie Payton and Alex Bennett, both with16. Coolum were able to reach the target in the 18th over for the loss of 3 wickets. Wicket takers were Mike Thomson, Robbie Payton and Tom Stewart. The captain says that with a little more discipline and hard work the team can come back into the winner’s circle in their next match against Maroochydore at Read Park next Saturday. THIRDS: Playing away against Landsborough the TNT team won the toss and elected to have a bat. Brendan Wright and Tom Green started well with Brendan playing some good shots before he was out on 15 with the score on 27. After losing two more wickets, Sam Forrest and Jason Toohey came together with the job of getting the innings going. 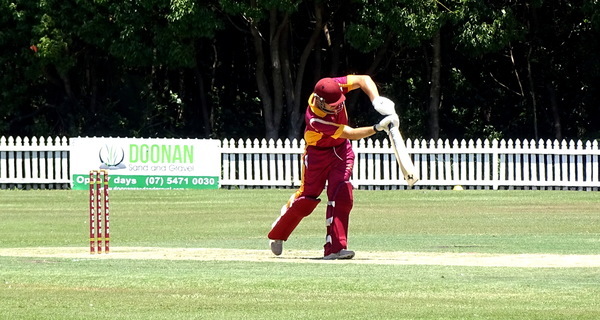 The pitch was staying very low and this suited Forrest as he proceeded to belt the Landsborough bowling. When they pitched up, he belted them over the top, bowled short he hit them square. Captain Jason Toohey backed him up by rotating the strike. The scoring rate increased and after 40 overs the team had scored a competitive 3-189 with Forrest 80 not out and Toohey 46 no. They had registered an unbeaten partnership of 151! TNT’s bowling started off a little ragged and never really recovered and a dropped a catch cost the team over 90 runs. Landsborough lost their wickets at 58, 93, and 101 and eventually passed TNT’s score for the loss of 4 wickets. Cody Wright bowled with some good heat to finish with 0-24 off 5, Will Gear took 1-32 and Steve Sinclair had the pick of the figures with 2-45 off 8. Tough day in the field for the boys-it happens. Onwards to next week when the team will be at home to play Yandina. FOURTHS: Playing Maroochydore at home, TNT bowled first in a match they had to win well to secure a place in the one-day final. Tight bowling and excellent fielding (without a dropped catch) ensured they were always in the hunt for a maximum point opportunity. The result, Maroochydore were all out for 89 off 27 overs. Wicket takers were Wayne Moore 4-17 off 7, Graham Chaplin 3-15 off 7 and Jack Saunders 1-22. Catches to Talbot, Latimer, Anstey, Gesell and Joe Jurisevic with a run out by Craig Moore off a great throw by Latimer. The run chase was over early with Tewantin finishing on 1-90 in the 17th over. Scorers were Craig Moore 27 no, Dylan Leggett 22 no and Brian Lee 19. An early finish and a bonus point win which should see the team have a good chance of a place in the one-day final. Next match is against Palmwoods at their home ground.